To complete our intercooler component lineup for the 2015+ Ford Focus RS, we at Mishimoto would like to introduce our Hot-Side Intercooler Pipe. This pipe has a truly innovative design that helps cool more than just air intake temperatures. It increases internal volume by 40% over stock with 2.5 inch inlet and outlet diameters, and maintains an average pressure drop of 45%. Included in the design is a cast mid-section that retains the use of the factory ducting that directs airflow to the front PTU. A standard cylindrical pipe restricts airflow, and this doesn’t help the known problem of overheating drivetrains when the RS is being pushed to its limits. Our pipe is shaped to direct air right to the front PTU using that front duct, so airflow isn’t lost like with a traditional pipe design. 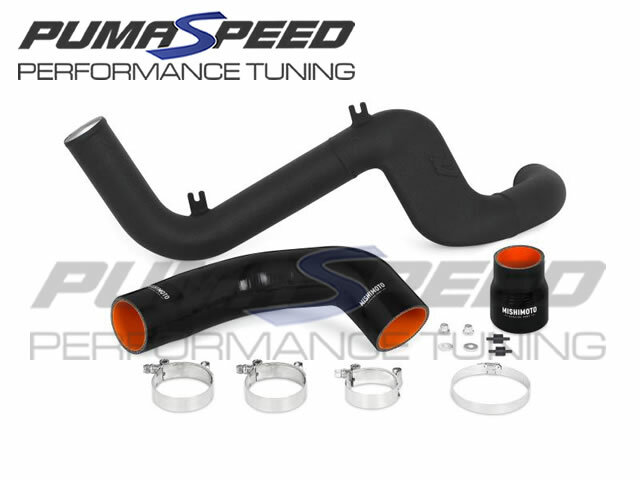 In addition, this pipe comes with 5-ply, wire-reinforced silicone to attach to the turbo and intercooler, providing superior heat resistance and flexibility to accommodate for engine movement. The pipe can also fit without removing the lower cross bar. The kit comes with all necessary hardware, is a direct fit with no modifications necessary, and is backed by the Mishimoto Lifetime Warranty. The Pumaspeed Workshop team are ready to fit the Mishimoto Focus RS Mk3 Hot-Side Intercooler Pipe Kit in our Head Office located here. Therefore making parts and labour a total cost £323.50 (inc. VAT). Pumaspeed have a specialist distribution team that can dispatch the Mishimoto Focus RS Mk3 Hot-Side Intercooler Pipe Kit to any destination worldwide.